There is a new site marinaratings.com which allows you to rate and view other boaters ratings of marinas. This will be a handy tool while you are cruising. Visit Gulf Islands Cruising School Ltd. for more information. How to outfit a galley, provision, and prepare meals on two burners is a new page just added to our Web site. I trust all the fathers had a great day. Steven and I spent most of the day at the Victoria Fish and Game Protective Association property. We had opportunities to shoot rifles, pistols, shotguns and Steven had a chance to fish in the pond. He didn’t catch a fish, however we saw four other fish caught while we were there. June 13 – 15, 2008 is BC’s Family Fishing Weekend. Our son and I have participated the last two years and we plan to be involved again this year. 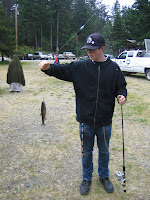 On Father’s Day we will be going to the Victoria Fish and Game Protective Association. We will have the opportunity to try fishing, shooting and archery.